A team of domino-builders from Hessen in the middle of Germany, the Sinners Domino Produktion, successfully attempted to break an official Guinness record today - with an incredible 30,000 dominoes, their spiral was the biggest one ever built out of dominoes. Another record they wanted to break went wrong in quite a dramatic way: A few minutes before the planned falldown, with the audience and TV cameras already in the hall, the 30-meter-long wall toppled all by itself. The rules are not clear on the point of whether such an unintended topple can be counted as a a record, so the team will have to hope for mercy from the folks at Guinness World Records. Of all the domino world records, the stacking record is the one that is most incomprehensible to me. I somehow managed to set 300 dominoes on one, but that was the best I could do, and I have no idea how 1,000 and more are possible. It is possible to Max Poser a.k.a. mmcodomino, and after a lot of practising, he even managed to enter the Guinness book by stacking 1,002 dominoes on one, beating the Domino Day record by far. Now he has been beaten himself. Alexander Bendikov already used to hold the record back in ancient times (by which I mean the nineties), and now he has it back. 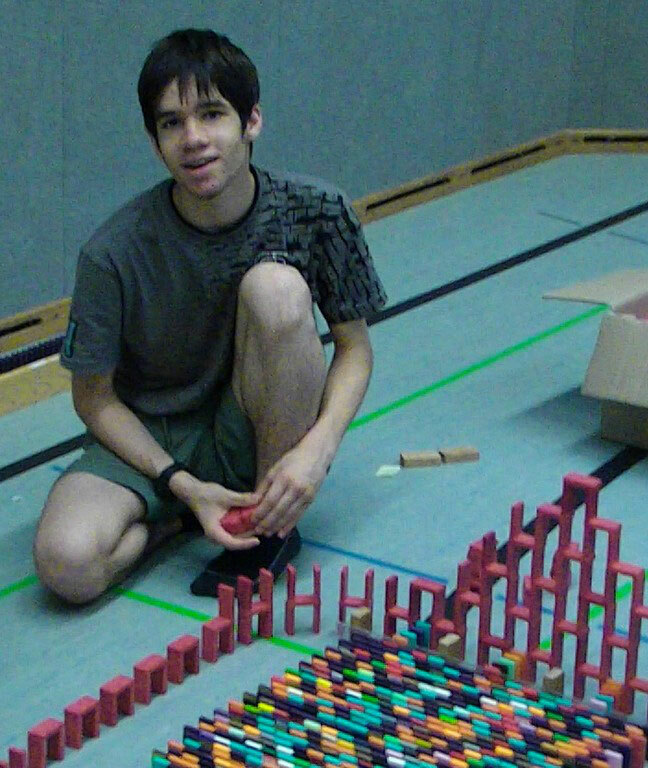 He stacked 1,008 dominoes on one already on July 5th. On the following day, he even completed 1,036, but apparently that was an inofficial attempt, so the Guinness record is 1,008. Thanks to TimDomino for telling me about this! Tim's monthly domino podcast features quite a well-known domino-builder again. He is actually the most "prominent" one in Europe if you judge from the number of subscribers on their YouTube channel: BerserkerBerlin currently has more than 6,200. This is quite remarkable because he doesn't belong to the category of domino freaks who started building domino as a kid after watching one of the early Domino Days. As he says in the interview you are about to read, he started just two and a half years ago. But it really didn't take him a long time to become a very precise domino-builder and to get from small "experiments" to large, colorful projects. His view and subscriber count raced higher and higher at the same speed. But enough introduction, I'll let you read what he had to say in Tim's podcast interview. TIM: We'll start by having you introduce yourself. BERSERKER: My name is Alex, I'm 21 years old and a domino-builder since the end of 2008. My achievements so far are an interview in the newspaper of the company I work for, then of course CDT 2010 last year, and since the end of February, I'm a YouTube Partner. TIM: Now what's the story about your interesting nickname? I mean, it doesn't really have anything to do with your actual name. BERSERKER: Berserker is a German rock band from Berlin, and when I joined YouTube in 2006, I just couldn't think of a better name in the rush. I just took this one because I had music by Berserker playing in the background. I didn't have anything to do with domino yet, you know. So when I started building domino, I didn't think of making a new account for the domino videos. I mean, I couldn't have an idea of what a big deal it would become. After a while, I had 50 subscribers, then it was 100, and because I didn't want to lose those, I kept the channel. TIM: A band from Berlin! That wouldn't have been my first guess. What is fascinating to you about domino-toppling as a hobby? BERSERKER: Since I was a kid, I've been fascinated by things like marbles, dominoes, and everything that had to do with chain reactions. And then I stumbled across domino videos on YouTube, and finally I bought some dominoes myself, started to build and try around. 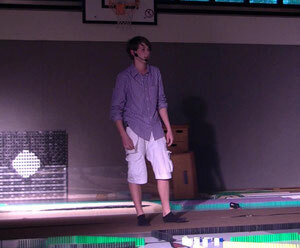 And after a while I started to film some of that and upload it. TIM: How do you manage to motivate yourself again when something has crashed? Or to put it differently, how do you feel then? BERSERKER: Luckily, the accidents I have are usually not too big. If they are, well, I'm pretty f****ed up of course. But it doesn't take longer than until the next day to get past that and rebuild the project. It's a fun hobby after all, so it's not really difficult for me to motivate myself. TIM: In the last podcast, I talked about ways to getting ideas for domino projects. It would be interesting to hear from you, a very well-respected domino-builder, how you find ideas for your videos. BERSERKER: From time to time, I just have an idea while I'm being at work or building another project. I write them down then and later collect and improve them. Sometimes it turns out that I can't realize them because I have too few dominoes, or too few of a specific colour, or too little space in my room. But it also happens that don't have any ideas at all what to build. I sometimes just sit in my room than and build things spontanously, and that can turn into an idea, but sometimes it doesn't and I'm "blocked" for a week or two. TIM: You've already participated in CDT, and I will join this year. Now I have heard that you won't be there this time. Could you clear that matter up? BERSERKER: Until July 19th, I'm a trainee at my workplace, and CDT starts July 29th. So for a long time, it was unclear if I would get some days after just a week after finishing my schooling, there are some restrictions on that. I had asked my future bosses a couple of times, but they couldn't give me any guarantee whatsoever. But now I can gladly tell you that I will definitely come to CDT this year. They have promised me to give me the days off. I really look forward to it, it's the highlight of the year for me. And I also look forward to getting to know you in person. I wish you the best for your future projects, podcasts and whatever else you do! Okay, let's stay realistic: Both of them have hardly any chance to win the NextUp contest. There will be five German winners, and four of those are almost certain yet because four YouTubers have applied that are already very well known (LeFloid, ApplewarPictures, iBlali, MrTrashpack - yes, German YouTubers have strange names). I like all of them, so I hope all of them will in fact win the 20,000 € each winner gets to support their work. BUT I guess it's still okay to keep a slight hope that the fifht place might be taken by a domino-builders - because there are two of them in the voting (out of 25, that's a number ridiculously high above average :D); as you could probably suppose after reading this article's title, those two are BerserkerBerlin and dominofan0803. Originally, it was planned to have 15 finalists after the voting. It is unclear now if that will be changed as they have only 25 people in the voting now, but if it won't be changed - then we should totally manage to make at least one of our domino colleagues one of the 15. Unfortunately, another domino-builder didn't make it into the finals: bigbobbydog was sorted out because apparently, they did have enough applications in Holland to select the few best. Other domino-building partners moslty didn't participate because they couldn't: The contest was open only to some European countries plus Japan. As you hopefully know, TimDomino publishes an awesome domino podcast at the end of each month. If you didn't know yet, shame on you. Anyway, the interview guest he was joined by this time is quite a "prominent" member of the domino community again: Tobias Demuth, also (or better) known as millionendollarboy. He's made a name for himself with his creative and very professionally made videos, mostly screen links that often include great fields, BC's and 3D projects. Since last year, he is a member of CDT and played an important role at the event when he did a brilliant job on the BC before the final field of the setup. He also hosts his own event, TPT, which is of course a lot smaller than CDT, but a record of more than 20,000 dominoes is still quite an effort. And last but not least, Tobias and I have had two meetings at my place before in 2009 and 2010, both times around Christmas, and we plan to continue with this. TIM: "millionendollarboy", now that's what I call an interesting nickname. So my first question is what made you choose that nickname - are you really that rich and a have a million dollars? MDB: I knew you were going to ask that... my nickname is actually quite a random thing. The day before signing up to YouTube, I had watched that movie "Million Dollar Baby". When I wondered how I could call my channel, that movie popped into my head... milliondollarbaby wouldn't have been a great name though, so I made it boy. Unfortunately, that name was taken. So I just put the "million" into German - "Millionen". And that was still available. So that's the origin of my nickname. TIM: Okay. So as far as I know, you used to hold an inofficial world record - what was that about? MDB: I had the record for the biggest domino pyramid. Sadly, that record was beaten by FlippyCat. I have even tried to get it back a couple of times, but had no success - probably because I have such an elastic floor in my room, so no matter who walks by the pyramid, it all starts to tremble. The problem about that is that the dominoes in the pyramid get slightly out of place each time so that even if you set them up as precisely as possible, it will collapse. After the fifth effort I finally decided for myself it was useless to try it on this kind of floor. TIM: [...] I have said before that in my eyes, the fascinating thing about domino is to see how much you can trigger with just a tiny movement. What makes domino so exciting for you? MDB: What thrills me most is the fact that you can create huge projects using only these little pieces. There is no limit to one's creativity, and that's what I like about it. TIM: So, which projects are you planning to do in the future? MDB: In a month from now, TPT 2011 will take place, and that is a quite big project that I'm working on. It will be about Harry Potter, and we will be joined by a builder from another place for the first time. I'm very optimistic that we're going to break our old record of 20 960 dominoes. TIM: Harry Potter, that's nice. You seem to be quite a fan of movies, I remember your great Pirates of the Caribbean project. My last question for you is: Is there anything you want to say to the domino community? MDB: Yeah, I do want to compliment Annodomino on his homepage, it's really good. As you know, I visited him last winter and I'm also looking forward to meeting him again at CDT this summer. TIM: I agree, Annodomino's page has turned out nice - but I still hope you visit mine from time to time, too ;-) Thanks for the interview. The first highlight of the domino year: Brattleboro! Brattleboro is a small town in Vermont that most domino fans probably are familiar with by now. That's because the director of the local museum stumbled across the domino videos of Mike and Steve Perruci, a.k.a. MikeMazeguy, in 2007 and invited them to host an event in the Brattleboro Museum & Art Center. It obviously was quite a success for the museum - the cooperation went on in the next year and has now seen its fourth edition. And this time, it was again more awesome than last year. Mike and Steve were joined by no other than ShanesDominoez, who apparently lives at the east coast as well, the birthplace of domino-toppling. The fourth builder was Aidan Finnegan, who calls himself "AP the dominonerd", but after watching his YouTube-Videos, it really looks to me - sorry - like he would need a telescope in order to catch a glimpse of ShanesDominoez' and MikeMazeguy's level of domino-toppling. A local TV station called WCAX covered the event live - very few domino events except for Domino Day get to be broadcast live - and also put together a nice interview. It reminded me of how young ShanesDominoez actually still is. With just 14 years of age, this guy is a pure domino wunderkind ;-) Let's hope he'll keeping using that talent in the future! I am a Domino Wizard, how about you? Well, if you are, you should totally buy this shirt. The shirt can be ordered here; it is available in various colours, and apparently you can also customize its design very freely (by adding more text or pictures etc.) - I didn't notice that at first, so I have just this blank shirt that doesn't even show I'm crazy about domino-toppling and not about the boring game the black and white pieces with the dots are used for. BerserkerBerlin is a YouTube partner! Recently, BerserkerBerlin has become YouTube's second to most subscribed domino-builder after FlippyCat (not counting the dubious "contrapionists" channel), and now he's even been accepted as a YouTube partner. He is the tenth domino-builder (if you count TheSprice17 as a domino-builder), the second German domino-builder and the first CDT member to be accepted. Since I know him from CDT, I can tell you he's not only a fantastic domino-builder, but also a very likeable person. So I'm really happy for him. According to this interesting tool, his partnership will get BerserkerBerlin about 2000 $ annually, and I think he deserves that for his videos. My own application is still sort of on hiatus. I can't re-submit it because I have already re-submitted it in December (I have originally applied back in November), so now I can't do anything but wait for a reaction from YouTube. And there's no reason why they should reply soon - expect that they are obviously checking applications right now, since BerserkerBerlin was accepted soon. It's quite frustrating though. Well, that's how interviews are made in such a small business as the domino-toppling business. 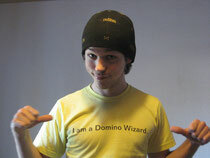 Every month, TimDomino publishes a podcast on his homepage www.domino-tim.de that is all about domino-related news and topics. It is only in German, so it wouldn't make a lot of sense for you to listen to those podcasts. But I think at least one rubric is worth being translated for the non-German-speaking domino world: The interviews. Tim started that rubric last month, and I had the honor to be his first "special guest". I didn't put that interview here though because there isn't really a lot of news in it if you have gone through this homepage. But maybe you are interested in what Tim's guest had to say this time: Niclas Thumm, the (informal) head of CDT, answered his questions about - CDT, of course. So here's the interview translated to English, and if you are for any reason keen on listening to the German original, just click here (the interview starts at about 30% of the podcast). TIM: I'm happy to say that I have a special guest in my podcast again. This time it is Niclas of CDT. [...] I'm going to join at CDT 2011 as well. What I want to ask you now is: What exactly are you responsible for at CDT? NICLAS: My job is to create the project plan; that means planing everything in advance - the way the projects go, the timing etc. That takes about 20 to 30 hours, just counting the actual work after you have come up with all the ideas. Finding the ideas is something the team does together; for example, this year's theme was suggested spontaneously by Raphael and Alex - DMRdriver and BerserkerBerlin - right after the falldown [of CDT 2010]. And then it just happened that everyone came up with ideas and I wrote them down the same evening. And now I tried to bring all of them together. That worked fine, the ideas fit well together, and that's how such a project plan is created. We [Simon and Niclas] also have jobs to do when the dominoes are set up at CDT, and those aren't easy jobs either. We have to coordinate the building, take a look that everything is set up correctly and also in the correct order so that it doesn't happen we get into trouble because the dominoes that are already standing block a corner of the hall. TIM: Sure, you need to be careful with that so you don't place the dominoes somewhere where you don't really want to have them yet and maybe topple something because of that. Thanks. NICLAS: I can't really announce a lot more than what you can see in the trailer. What I can tell you is what projects there are going to be: The Adventures of Asterix, The Simpsons, Lucky Luke, Spiderman, and at the end Snoopy. And about Snoopy, I can give you some information: We are going to have a Builder's Challenge there that is connected with a field of 15,000 dominoes - so if the builders (it will be a BC for three or fours builders) aren't successful, we would have just 140,000 dominoes left if everything else works. So it's really a big Builder's Challenge this time, and it will also be quite tricky and a new kind of BC. So you can really look forward to it. TIM: What about the builders? NICLAS: Probably between eighteen and twenty people this time. One of them will be former Domino Day builder Marcel Kamps. We also have our first member from Switzerland, Matthias, so the team has already grown a lot again. It is getting really international, and we're happy about that - Germany, Holland, Switzerland, what will be next? Who knows, maybe Spain or even America. That would be awesome. TIM: So, I still have a really stupid question left to ask: Are you looking forward to CDT? NICLAS: Sure I look forward, especially because it's the only time of the year the whole team comes together, we talk to each other about what has been going on in the meantime and have a great time together. Just like Alex (Annodomino) said in the last podcast [thanks for the credits :D], it's like a holiday camp, but with a great goal the team wants to achieve: the falldown that happens at the end. I'm also happy to have new people in the team and that CDT is growing - we even want to hold a community meeting where every domino-builder is invited to come to us and join us for a project of, let's say, 50,000 to 60,000 dominoes of all the YouTube dominoists who want to participate. We'll have to see if that will be possible, and when. But it is definitely something we plan to realize soon after CDT 2011. Anyway, I'm excited to see how CDT will turn out this time, I mean you can never know that in advance. And thanks for the interview, Tim. No project is as scary to domino-builders as trying to build the biggest 3D pyramid - it usually results in many, many hours of concentrated work for nothing because you finally make one little mistake and everything crashes down. Currently FlippyCat is holding the record with a 25 x 25 pyramid; millionendollarboy has failed several times trying to break that, and so have others. That means he will start earning a little bit of money through ads placed next to his videos soon. (Just a very little bit in the beginning, but the amount usually increases sooner or later.) And I think that's only fair, considering how much work is put into a domino video. dominofan0803, by the way, also helped me create the rubric "About domino" on this homepage by searching the web like crazy for information on the history of domino-toppling. Among others, he found out that there was a domino event in Japan in 1996 in which 1.8 million dominoes were toppled, meaning that Domino Day 1998 did not set up an actual world record! Thanks again for the help. My own partner application is still due to be checked, I haven't received an answer from YouTube now in six weeks.